As with all things in the world of food and drink, Kitsch didn’t start in a laboratory, it started in a kitchen, Craig’s student kitchen to be exact. Fed up of bland, boring and artificial soft drinks, he decided to ignore pending examinations and focus on making soft drinks better. Better for you, better ingredients, and most importantly, better tasting. A lot of experimentation, a few semi-minor carbonation explosions and a lost flat deposit later, Kitsch had their first recipe; Rhubarb & Thai Basil. 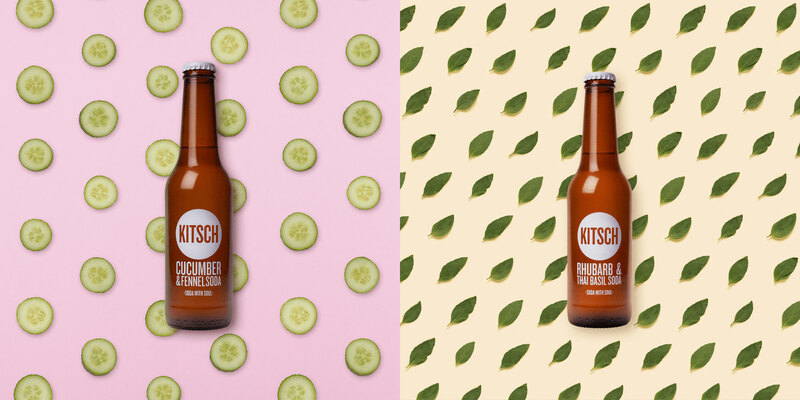 Several years on, Kitsch is available around the UK in a variety of flavours, on a mission to reclaim soft drinks shelves from the corporations, and help their drinkers live a life free from the bland, boring and the artificial. As a brand we have always enjoyed and admired, Campfire were pleased to collaborate with Kitsch on creating an identity system and accompanying series of product photography. Inspired by the simplicity of Kitsch, we used their natural ingredients to create real, physical textiles set upon pastel backdrops, representative each soda flavour. These assets were photographed in our in-house studio, and have been built as extensively re-touched, layered PSDs, allowing infinite combinations of colour, pattern and layout to be created efficiently into the future. The modular nature of this project allowed us to easily animate the individual components from our newly created Kitsch library, as quirky GIFs for social + display, and as a package of graphics optimised for web, print, display, and social. 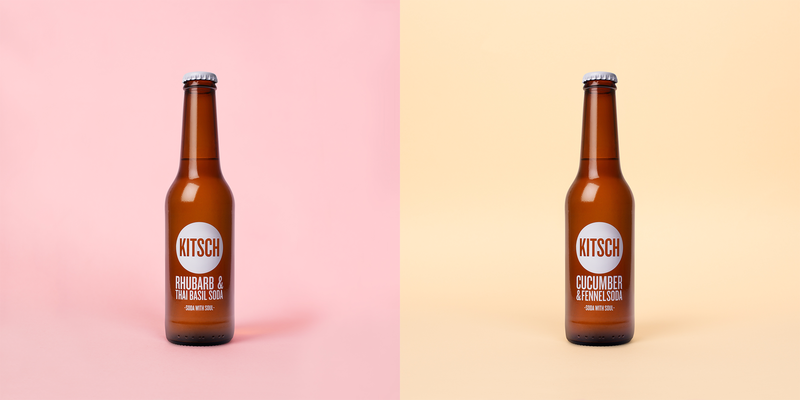 If you haven’t already, we’d highly recommend grabbing yourself a Kitsch craft soda from your nearest stockist, or via their online shop.